Whenever you decide to buy furniture for your house, it is essential to think of it from a perspective of a fully furnished house to give you a better picture of what all would you like to place in your house and at which nook and corner? And as you explore your options, you will find the right pieces of furniture to suit your homes. At Sublime Exports, we assist you to create furniture according to your choice , to suit your style and specifications of the home or room! 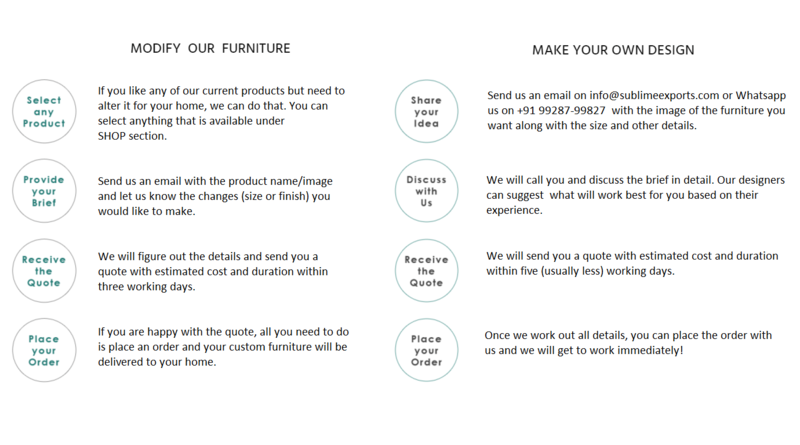 If you like any design on our website that you’ve seen like a bed or dining table , you can ask for any customisation you need further and we will have it handcrafted especially for you. We also customize sizes of the furniture to suit the size of your rooms. We also believe that “As you evolve, your living spaces should too” and therefore if you are planning to renovate or redecorate your home and have a need for a particular type of furniture, we are happy to cater to your request.